Globe Telecom announces via a corporate blog that the network will start offering two new postpaid plans under the Tatto Black brand, Globe’s premium mobile broadband stick. These new plans will utilize their 4G LTE broadband technology. 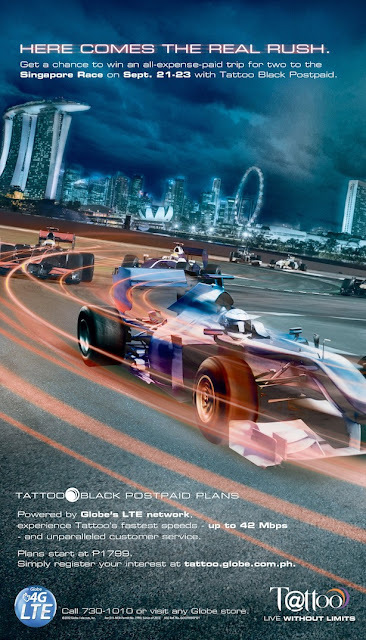 Globe Tattoo Black will be offered in Plan 1799 and Plan 2499. Both plans will have a dedicated hotline for customer service and technical assistance. Subscribers will also experience priority assistance in all Globe stores nationwide. Under the Plan 1799, subscribers will get a free USB dongle and will enjoy Internet speed of up to 28Mbps. Those who will be getting the Plan 2499 can connect to up to 42 Mbps. In line with the announcement, Globe also came up with a promotion. All interested parties will enter to a raffle for a chance to get an all-expense paid trip to the Singapore Grand Race. Consumers should register their interest to avail of the Tattoo Black Postpaid Plan via the tattoo. globe.com.ph portal where they will fill up a form to enter their personal information. Last day of registration is on September 14, 2012, 12 noon. Raffle will also be on the same date at 1 PM. “Ultimate speed and pure spectacle is what Tattoo Black is all about, which is very much similar to the Singapore Race,” a Globe official said in a press release.